AIC focuses on Positive Behavior for Learning, teaching and counseling students the behavior expectations and our Behaviour Management Team provides quality pastoral care to ensure that students are supported to achieve their goals. Low level Misdemeanors: 3 warning policy. If a negative is given a discussion is taken place and a suitable consequence decided up by the teacher e.g. recess/detention lunch. Coordinator will take note of the negative but will not act upon first negative. 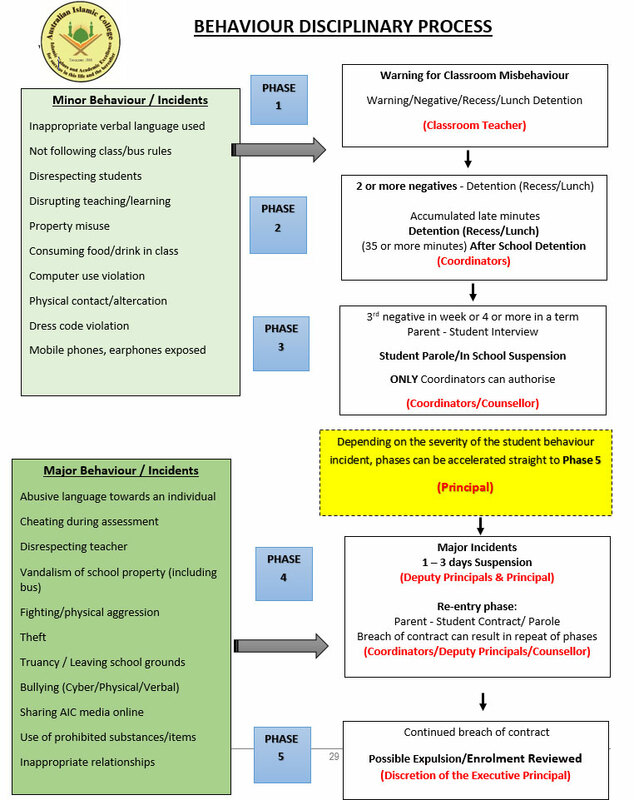 When 2 or more negatives have been received (from any teacher) coordinators will intervene, by calling parents and following a suitable consequence highlighted within the behavior policy. Late Minutes – first time offenders who accumulate 35 late minutes will result in recess/lunch detention, second time offenders will result in after school detention. Third time offenders will receive a 1 day suspension. 3rd negative in a week or 4th in a term will result in an automatic parent interview, the student will be placed on a parole system for a week and will serve a one day school suspension. The student will also be booked in for two counsellor sessions. (This will all be done by the Coordinators). Please note that no students will be accepted into the suspension room or to coordinators classrooms without coordinators consent. If any major incident occurs in your class, you must email the relevant coordinator/Deputy Principal detailing the incident which will then be investigated thoroughly and appropriate action will take place. If an incident is to occur which cannot await an email then you have the option to call any of the coordinators for immediate intervention. Students will be placed on a contract and will have continued counselling sessions. If this is continually breached, then phase 4 could be repeated or it could be escalated to phase 5.